I know I've seen mention of white markings on Shibas before, but I don't think I'd ever seen a Shiba with more than white feet or a spot on the chest. Now, I would have taken her for a Shiba mix (and maybe she is--though in her other pictures especially, she does look very Shiba to me except for the white markings and ticking). I don't know a ton about the genetics of white markings, though I would guess if she is all Shiba, this type of pattern would result from breeding white-marked dogs to one another (possibly over several generations)? Is it something that turns up with any regularity in pet-bred/mill Shibas? Extremely cute dog, and I'm sure there's probably been some kind of discussion about irregular color patterns on the Shiba side, but it just struck me as interesting and something I don't know all that much about. Pinto shibas do have more white markings on them. So she might have some of that pinto marking in her gene pool. Or she might be a mix! That's kind of what I expected--that if present in purebred Shibas, it would be a result of marketing mill-bred dogs who came out nonstandard colors as 'rare.' Not that nonstandard colors don't crop up in litters from responsible breeders, but that they would only be selected for by mills and 'oh that's cool-looking' pet breeders. This was just the first time I'd seen a photo of a Shiba (or mostly-Shiba at least) with so much white, though I guess I imagined pintos as being a piebald pattern (as in, mostly white with some colored patches--head, tail base, etc. ), but it makes sense that there would be an intermediate form like this as well. I guess I don't look closely at mill Shibas and their coloring that often! Petland ads come up on my Facebook feed sometimes for some reason (and make me sad every time). Next time I see one I might look at what their sad-looking mill Shibas actually look like and see if they tend toward more white too. 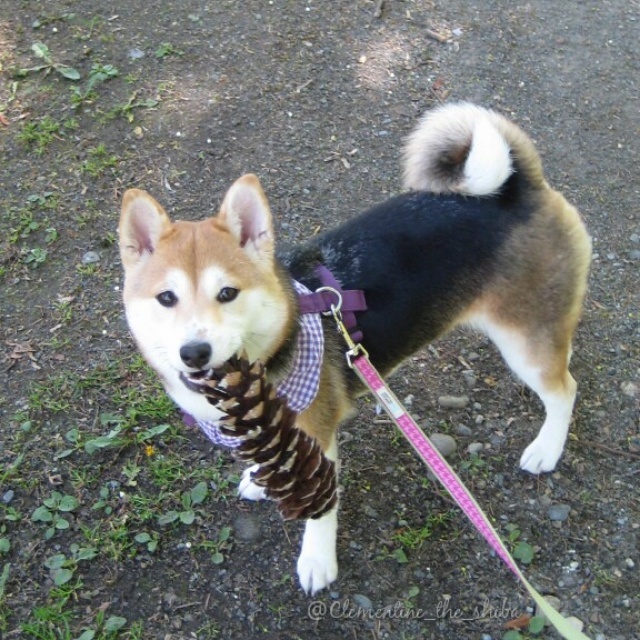 Actually, because of urajiro, most black-and-tan shiba are largely black-and-white. The urajiro covers the normal irish spotting that is common in the breed. What you're seeing here is a LACK of urajiro, so you can see the irish spotting it normally obscures. There is some urajiro though, evidenced by the symmetrical white patches on the cheek. I'd have to quibble with PoetikDragon. Black/tan Shibas are supposed to have less urajiro than red Shibas (black/tans ~ "bow-tie" on their chest), and their urajiro should be edged in tan where it meets the black. They should not have Irish spotting where Irish spotting is defined by white up the legs, tail, chest, and neck/collar. What you're seeing here is not lack of urajiro. It's too much white spotting. Up all the legs, up the tail, up the chest. Pinto coloring was originally part of the Nihon Ken, but was excluded by modern standards. There are some nifty pictures of Pinto Kishu, Shikoku, and Akita somewhere on the forum. Anywho, I've seen a few Pinto Shibas. They certainly are cute, and that above Shiba (like ayk said) is Pinto, not lacking urajiro. The pinto actually covers up the urajiro markings. My Laika has "urajiro" but it is covered by his white markings. On Flint, the counter-shading is cream, so I can tell the difference between it and the white markings. It's very difficult to see in pictures, but the white is definitely over all other markings. @ayk Your statements are correct, however, what is standard and what is common is not the same thing. There are a lot more Shibas that come from less-than-reputable sources and excessive urajiro/white fronts is very common. I pretty much only see correct red faces on imports and show dogs - not the pets you see random people with on the street, on packaging/advertising, pet bloggers, etc. Black-and-tans are already rare, and harder to show, so many of the ones you do see aren't to standard. The vast majority I have seen are black-and-white. Black with no tan is very incorrect, but very common in Shibas. B&t Dogs that are not perfectly marked are not shown for the most part, as the faults are so obvious, whereas with reds and sesames there is more wiggle room. This seems like a chicken/egg argument! Here's Kira, she's probably a pinto too. Reminds me of Corgi or Beagle markings vs Shiba markings. I've only seen red/white pintos. I don't think the dog will have creeping tan. So s/he will keep the black head with red and white muzzle.